by John A. Fliter and Derek S. Hoff. University Press of Kansas. 2012. 224 pages. Cloth $34.95 ISBN: 978-0-7006-1871-2. Paper $19.95 ISBN 978-0-7006-1872-9. Like all books in the Landmark Law Cases and American Society series, Fighting Foreclosure is an in- depth looks at the series of phenomena which conspired to produce an important Supreme Court ruling which greatly impacted American society. Like so many individuals who are the focal point in landmark cases, there was nothing overtly remarkable about John and Rosella Blaisdell; they unwittingly saw their circumstance become the representation of so many similarly situated individuals during the Great Depression. The Blaisdell’s home was facing foreclosure as they struggled to make the necessary mortgage payments to the Home Building and Loan Association. They turned to their elected officials in their time of need. The 1930s are often highlighted as point of drastic change in the relationship between individuals and government; laws such as the Minnesota Mortgage Moratorium Act are precisely the reason why. Through careful consideration of the historical, political, sociological, and constitutional questions that such legislation both reflects and produces, Fliter and Hoff tell the story of one family’s connection to the demise of the Contracts Clause and the Supreme Court’s evolution in interpreting the United States Constitution. Particular attention is given the long standing debate in determining the proper role of government regulation and especially government boundaries in times of economic emergency. A number of significant cases contributed to the evolution of the Court’s rationale concerning the constitutionality of economic recovery legislation; this book tells the story of the first such legislation, state or federal, to reach the Supreme Court. It would be incorrect to infer that Home Building and Loan Association v. Blaisdell (1934) was a forgotten or overlooked case. Indeed Blaisdell is standard to the syllabus of any Civil liberties class making use of the case studies method. Yet it is also true that Blaisdell is not considered as central to the Hughes court legacy as cases such as Nebbia v. New York (1934), West Coast Hotel v. Parrish (1937), or especially NLRB v. Jones and Laughlin Steel (1937). Fliter and Hoff use this occasion to explain why Blaisdell’s second tier status is misguided. Fighting Foreclosure is the story of depression era politics which brilliantly weaves the story of the Blaisdell family from Minnesota into the macro movements of the progressive era and into the Depression. Equal parts history and political science, the book seamlessly describes the political environment of the early 1930s from the perspective of farmers and laborers as [*372] well as elected officials and Supreme Court justices. Although Fliter and Hoff reveal a preference for progressive policy of that time (at least compared to the alternative), each side of the debate concerning the proper role of government action in the time of crisis are presented fairly. The opening chapter provides necessary backstory of the many of the elements that eventually shape the controversy in the Blaisdell case. Fliter and Hoff describe the debate surrounding the Contract Clause at the constitutional convention using the best available sources. They find that “in many ways the Contract Clause and other provisions of Article I, Section 10, were a reaction to state efforts to help debtors” (p.11). This is of course an important point because the contested law in Blaisdell, the Minnesota Mortgage Moratorium Act, was precisely such a law. Discussion is given to Beard’s thesis and the words of the Federalist papers are analyzed to describe potential meanings the founders might have prescribed to the Contract Clause, a small portion of the Constitution that declares that no state shall enter into a “Law impairing the Obligation of Contracts.” Fliter and Hoff observe that although the Contracts Clause most assuredly represented a victory for the lending class, there is little historical record to accurately attribute a specific meaning to the prohibition. Next, Fliter and Hoff discuss the Supreme Court’s Contract Clause jurisprudence from its beginnings until the 1930s. This chapter, while perhaps overly exhaustive to the lay reader, is extremely informative for those who are passionate about the Court’s history or those concerned with tracing the development of legal doctrine. Discussion of the weight the Court afforded the Contract Clause early in its development gives way to a discussion of the Lochner era, in which the Court reviewed state economic regulations under a liberty to contract the justices located in the 14th Amendment’ s due process clause. Careful consideration is given to The Rent Cases, decided in 1921 and 1922, in which the Justices upheld emergency and temporary rent control laws under state police powers. This is necessary as the precedent established there becomes central to the debate in Blaisdell. Fliter and Hoff explain that although the Article I Section 10 limitation on state power remained, by the time the Court was to hear Blaisdell “the Contract Clause had been weakened as a protection against state intervention in contractual obligations” (p.46). Chapter 3 provides a historical account of the growth of the Farmers Holiday Association. This national organization argued extensively in favor of state and federal government policy that would improve worsening financial conditions for farmers. This group and others like it were central in driving pressure on elected officials for economic reform and greater government intervention in to the economy. Fliter and Hoff make use of newspaper accounts of the era to highlight the Association’s activities, and also to highlight the perceptions of and reactions to the Farmers Holliday Association. The use of primary sources in this fashion is a strength throughout the text. While active in Iowa and the Dakotas, Fighting Foreclosure describes this political movement especially as it played out in Minnesota. At the time contentious debate developed in the [*373] legislature and the public about the proper role of government in regulating economic conditions. The intensity of such discourse would only increase as the Great Depression began to cause farmers (and others) to be delinquent on their house payments. Chapters 4 and 5 provide details of the political process in Minnesota that led to the passage of the Minnesota Mortgage Moratorium Act. When the legislature had not provided mortgage relief by early 1933, Minnesota Governor Floyd Olson did just so through an executive order directing law enforcement agents in the state to refrain from foreclosing on any mortgaged property. Immediately the debate raged as to the constitutionality of such action. Critics decried the violation of the contractual rights of lenders and proclaimed the state had clearly impaired contracts in a way that could not stand constitutional muster. Yet Olson was quick to defend his actions, arguing that “in a time of emergency he had simply postponed the fulfillment of the contracts (of the lender’s remedy) but had not abrogated property rights” (p.71). Although the Act was complex in its structure the philosophical debate in Minnesota was not particularly so; either the state had the authority to exercise its traditional police powers in such a fashion, or the executive order violated the property rights of individuals with established contracts. There are several other interesting points discussed in this chapter, most notably how the difference in method economists and historians use greatly influences their determination as to such a laws effectiveness. The book next explores how the Minnesota State Supreme Court considered various positions before ultimately upholding the State law. The next two chapters shift the focus to the United States Supreme Court. Chapter 6 takes a break from the Blaisdell narrative by providing a rich description of each of the members of the Hughes Court that would hear the controversial case. Detailing a Court which featured four conservatives, three liberals, and two swing voters (as the ideologies where understood in the 1930s), Fliter and Hoff demonstrate that “the Hughes Court shaped the contours of the modern regulatory state by greatly expanding the power of both the federal government and the states to regulate economic activity and respond to economic crisis” (p.109). Each of the justice’s characteristic legal reasoning is described in this chapter, yet the authors wisely provide examples where each had not voted as expected. This chapter demonstrates why, three years prior to the constitutional revolution of 1937, the individual justices, and the High Court collectively, were difficult to forecast. This sense of unpredictability combined with the extreme nature of the situation at hand made the Blaisdell ruling one of the most anticipated of its day. The book next considers the various reactions to the case. Once again demonstrating the ample research and primary source use that make this text so credible, Fliter and Hoff provide newspaper accounts, politicians speeches, and letters to the editor or politicians from lay persons describing the general mood in response to the Court’s ruling. While support for the decision was strong, there was certainly negative reaction as well and each is featured prominently in chapter 8. Two interesting discussions emerge at the end of this chapter worth noting. The first asks if those who declared the Blaisdell ruling the death of the Contracts Clause were correct? In the short term the answer was no. The Court’s voting alignment in this case did not last, and produced frustration that prompted president Roosevelt to famously suggest his Court Packing Plan. Yet in the long term the answer is more nebulous. Many would hesitate to proclaim that Blaisdell was in keeping with the meaning of the Contracts Clause, yet still proclaim the Court’s ruling as the best outcome overall. This leads to inconsistent notions related to the constitutional meaning of the Contracts Clause to date. Second, what would become of the Blaisdell family? The record is short on their reaction to the ruling. What Fliter and Hoff describe is certainly less than a story book ending. John and Rosella were divorced by 1935 and it is unknown how long Rosella stayed in the residence. As for the property that was the cause of such controversy, and “The location of the house, 1518 Linden Avenue [Minneapolis], is now a parking lot for a small business” (p.156). Fliter and Hoff close by asking if the Contracts Clause is truly dead. Much evidence suggests that the answer is [*375] affirmative. Yet a fascinating subtext permeates chapter 9. Speaking of the Constitutional revolution of 1937, the famous “switch in time that saved nine,” they highlight two separate schools of thought. Some scholars have described the change as a dramatic shift in the Supreme Court’s interpretation of the proper role of government, while others feel that the Court’s “revolution” was simply the culmination in the Court’s evolution in embracing the notion of a living constitution. Fliter and Hoff suggest that they subscribe to the second theory, and much in this book supports this position strongly. While likely not the main goal of the authors, this is one of the book’s most important contributions to our evaluation of the Hughes Court. There is also a detailed description of Legal Realism as a theory of judicial behavior and a summary of how Blaisdell is discussed today. Chapter 9 nicely brings the story to a conclusion in the way most important works do, by providing the thoughtful reader with as many questions as it has information to form them. Overall this book is highly recommended for a variety of different audiences. There is much to be enjoyed and learned for those interested in history, politics, and/or Constitutional law. The book provides enough depth to offer something to all readers. While a book about one case might appear narrow in scope, some may find it a suitable candidate as a supplemental reading for an undergraduate constitutional law class to highlight the intricacies that each case represents. The ranging subject matter as well makes the book attractive to beginning students. Additionally the book makes fine reading in any graduate course related to the topics, and would provide all scholars working in the Constitutional law or public law subfields a deeper understanding of the Hughes Court. Fliter and Hoff have detailed the important events surrounding the Contracts Clause and the Blaisdell case in a book that is easy to follow, clearly written, and well organized. Each of the Chapters could stand on its own as a specific case study, yet they seamlessly come together to provide the reader the full story of this particular case. The stated goal for this book was to “contribute to the never ending debate about the appropriate roles that federal and state governments should play in regulating the economy and providing relief to distressed citizens” (p.8). 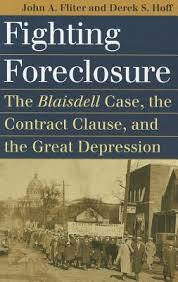 In Fighting Foreclosure John A. Fliter and Derek S. Hoff assuredly accomplish this task. Home Building and Loan Association v. Blaisdell 290 U.S. 398 (1934). National Labor Relations Board v. Jones and Laughlin Steel 301 U.S. I (1937). Nebbia v. New York 291 U.S. 502 (1934). Copyright 2013 by the Author, Colin Glennon.